Our mission at St. Martin’s Lutheran Preschool is to facilitate your child’s awareness and understanding of the world around them and to foster a positive self-image and respect for others. 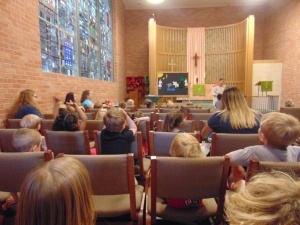 St. Martin’s Lutheran Preschool seeks to meet the needs of young children and their families by providing an educational program that addresses all areas of development—intellectual, social, physical, emotional, and spiritual. A highly qualified and experienced staff joins with parents to promote the healthy development of the whole child. Staff members devote hours of planning and preparing for teaching and nurturing the children in their care. Our curriculum-based Preschool program is designed to address the cognitive, physical, social, and language development needs of our students. Our environment is child centered and one in which children learn through experience and discovery. Children, through a child-centered environment, learn to use self-discipline, to talk and listen effectively, to solve problems and make decisions, to accept responsibility for their behavior, to share and work with others, and that they are important as individuals. Because our students come from a variety of backgrounds and educational experiences, they will be exposed to a variety of small and large group activities which can bridge the gap between home and school and lay the foundation for future learning. At St. Martin’s, “redirection” is our preferred method for correcting behavior. Basically, redirection is taking a negative situation and morphing it into a positive one. Redirection is an effective means to stop the inappropriate activity immediately and sets the groundwork for learning right from wrong. If appropriate, a teacher may use time-out as a way to give a child the opportunity to calm him or herself before joining the group again. Time-outs do not last for more than one minute per year of age. All of our students attend Chapel weekly. Our Chapel curriculum takes our children through the entire Bible in a very approachable way. We utilize the felt board, puppetry, and drama to tell stories in a simple way that conveys God’s love. All our students attend music twice a week. Our music curriculum teaches thematic songs, introduces rhythm and instruments and involves a lot of movement. The 3- and 4- year old classes will attend a theater class once a week. Our theater class will teach the children basics of self-expression and theater fundamentals. All classes will have Sign Language class weekly. All children will participate in additional art and science lessons twice a week. Children will gain self expression through tactile art activities and experience science hands on through developmentally appropriate experiments, which align with the curriculum and units of study at the school. All children attend a story time in our extensive children’s library once a week. 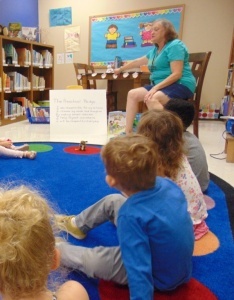 Ms. Betty reads books that coincide with the classroom lessons, teaches finger plays, and as the year progresses she teaches our three’s and four’s classes to check out books from the library. Our 3- and 4-year old classes also attend Stretch and Grow every week. Stretch and Grow is a preschool physical education experience that emphasizes listening skills and teamwork while developing motor skills and teaching about a healthy lifestyle. Our kids love Coach Bob and look forward to this day each week! Enrollment in these outside activities is separate and not included in our monthly tuition. Ask for more information and enrollment forms in the office. Each summer we put away our formal curriculum and do as much experiential learning as we can. We look forward to school-wide themes that encourage more puppets, more singing, and more play. We integrate water play days into our weekly routine and even have some special visitors. We embrace summer as a great time to be more laid back while still teaching and maintaining the valuable skills all our children will need for the next school year. © 2019 St. Martin's Ev Lutheran Church. All rights reserved.